Right now my home is “between” seasons and holidays. But that does not mean that there is not a nod to the time of year or the season in my decor! It means that I have taken down all the obvious, big and abundant seasonal decor like pumpkins and leaves and jack-0-lanterns, and acorns and deer sheds and put them away. I love having my fall decor put away before I drag out the Christmas decor!!!! 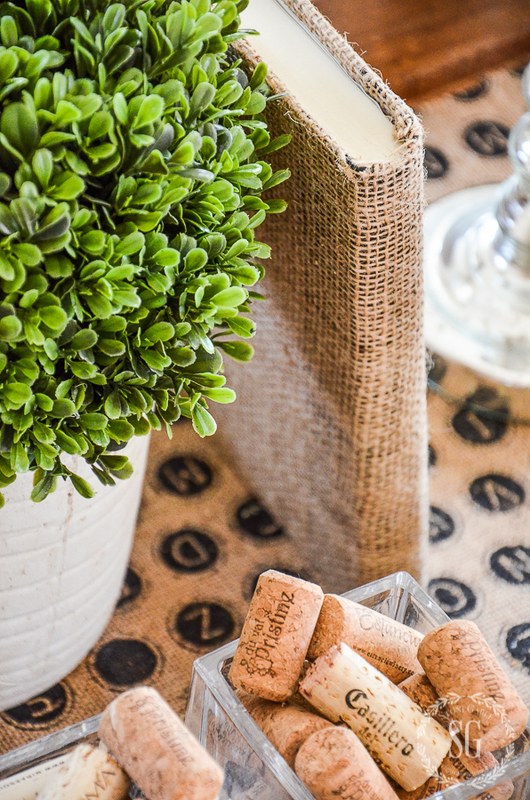 Transitional decor allows me to have a semi-clean decorating slate to work with. I usually choose one or two small decor elements to leave behind and enjoy. This year that means leaving behind the pinecones I used in the fall dough bowl I created and using them in a fresh way. 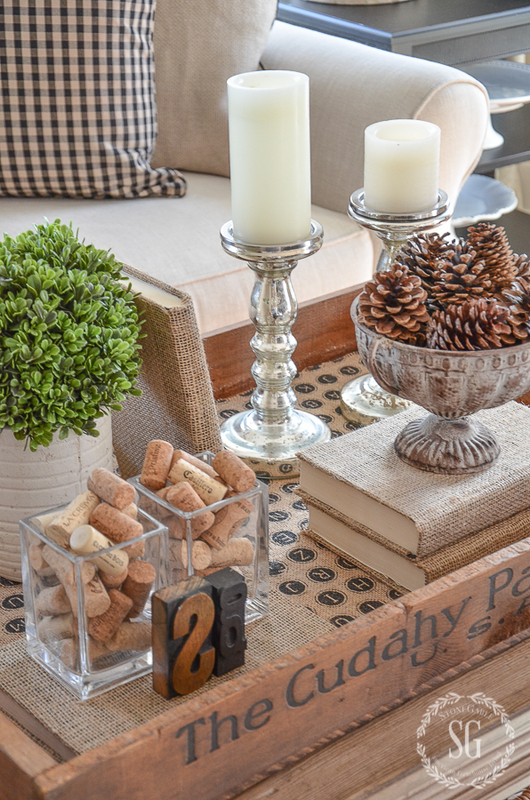 In this living room vignette I piled pinecones in a pretty vintage urn. 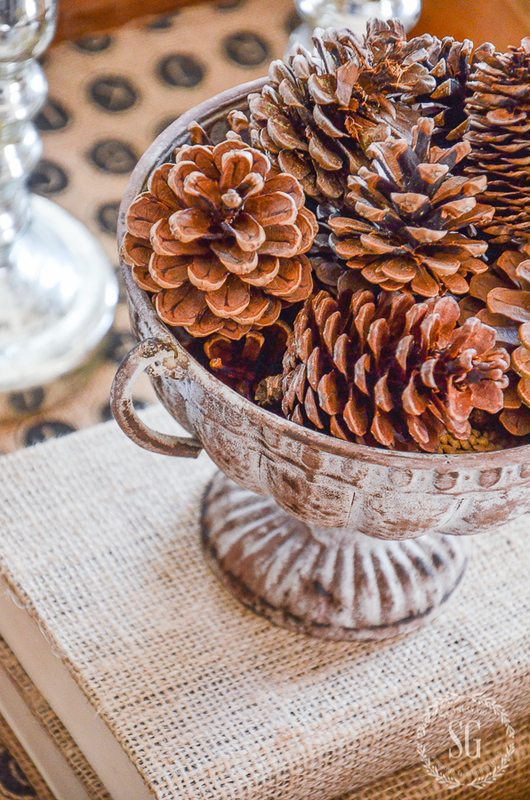 I love the look of pinecones for late fall decorating! Their color and texture sing late fall! My pillows have also taken a more transitional look too! Gone are the fall motifs and autumn colors. I replaced them with darker, neutral colors. I also like to add a little bit of organic elements that can work with the transitioning season. Boxwood is my first pick for fall to Christmas transitioning! I’m not a fan of what I have coined “crossholidation”. When two or more holiday’s decorations appear together! Like Christmas lights with spring decor or pumpkins and Christmas trees. It hurts my designer sensibilities! I like when my home is a clean slate! It makes me so much more creative and inventive! It’s hard to decorate a Christmas tree when there’s a pile of pumpkins laying on the floor to put away! Transition those pumpkins out! And give yourself a little window of time to enjoy a stripped down room. When all the excess of a season is removed a room is a whole lot easier to clean! Transitional decor is that clean slate! I can take down and put away transitional decor in less than an hour! So, pare things down and enjoy a less-is-more decor until it’s time to decorate for the next season or holiday! Give yourself and your home a little breathing room! If you are not ready for Christmas decorating yet but your fall decor is getting spent, try a little transitional decorating! Just found your blog today. I’m looking for some decorating blogs with transitional style. Seems so many have gone the farmhouse look lately and that’s not really my “thing”. Love your style! Welcome to the StoneGable family, LouAnn! So glad you found us! As always, your thoughts are so inspiring!!! I love the concept of transitional decor. I really need ideas for that transitional period between New Year’s Day and spring, so hoping you write a post for that! I guess that I am getting more into natural decorating, period. By that I mean using pumpkins, mums, astors, pine cones, etc. for Fall with a few Scare Crows or corn husks. This is from Sept through Thanksgiving. For Christmas I change out the mums for Poinsettias, Christmas Cactus, still using pine cones, and a woodsy themed Christmas tree, pillows and throws. It makes for much easier decorating and removal after the holidays! Love your ideas! YOU GO GIRL! Thanks for sharing! I don’t usually decorate for Fall, but after seeing all your beautiful things, I just might. 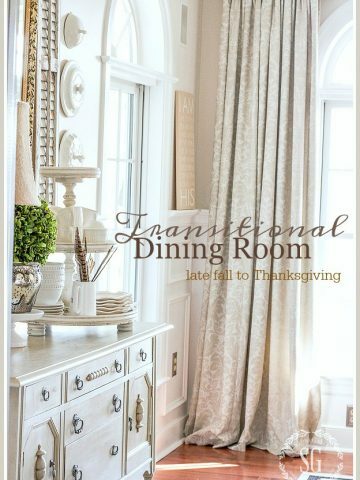 I really need to because Thanksgiving will be in my home this year! YIKES! Thanks for all your beautiful decorating pictures! I need to start decorating NOW!! HELP!!! I am at a point in life requiring me to pare down a lot. Less is more, simple and easy is better. I think your ideas make more room for focusing on being thankful and grateful for the people in our lives. I absolutely love your ideas! So inspiring.I was wondering how do you keep things organized? Do you store by holidays, color or rooms? Than do you store in your basement or attic or maybe a special room? I struggle to keep things in order so I don’t forget what I have. I’m always adding to my collection,Pinterest will be the death of me so many cleaver ideas and people! Thanks so much for sharing your talents with us!!!! I have a large basement that is the footprint of my home. I’ll share it in a post sometime in 2017. 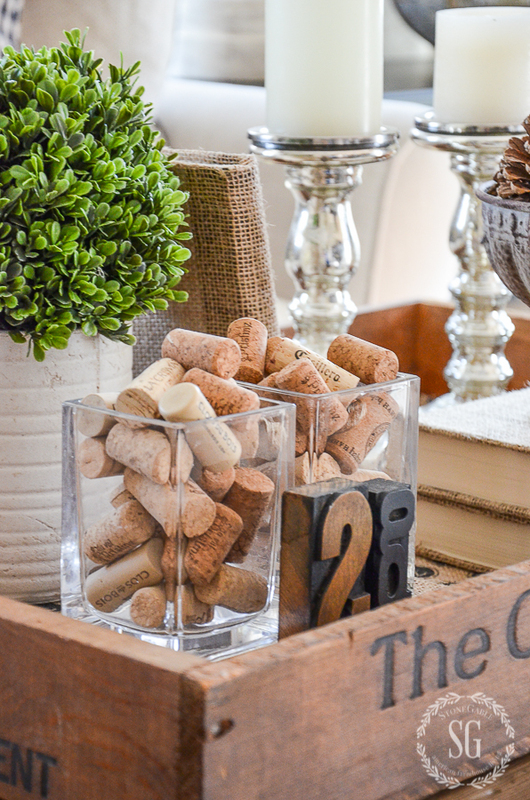 I love the corks and the pine cones! 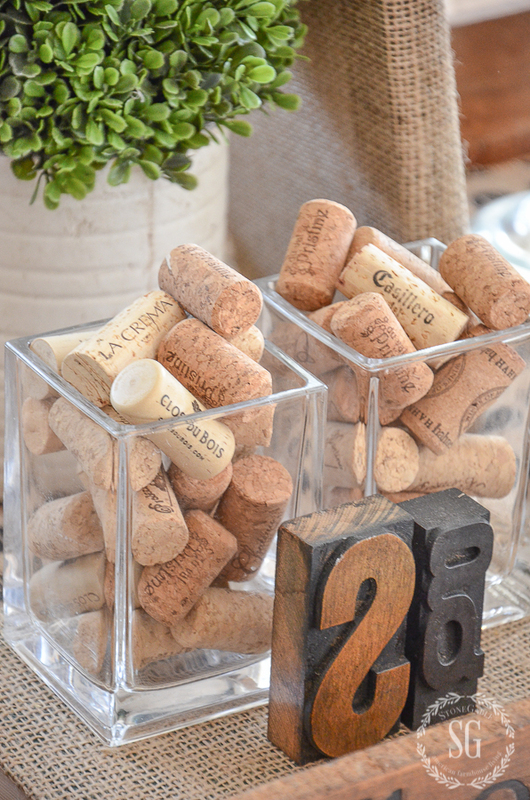 I’ve been saving corks, now I know what I’m doing with them! You just made me fall in love with all the pinecones in our yard! I love your idea of transitioning from season to season. I want to enjoy a season of Thanksgiving before I think about Christmas! I really like the burlap covered books! A great look for Fall or anytime. 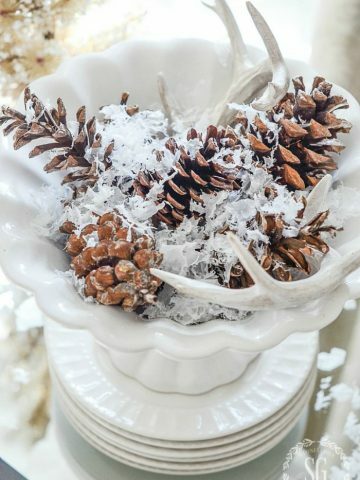 My “transitional” look includes piling the pine cones in my great-grandmother’s wood dough bowl; I try to include a few sprigs of holly from the yard as well. Thank you again for another fun post. Appreciate the new fresh feeling.. I also like to change pillows and throws to more fall and winter colors and weights and of course fall scents in candles and warmers ? Not what I expected a post about transitional decorating to cover but I love the idea of having a palette cleanser between seasons. Yvonne – thanks so much for sharing your lovely home with us. I love all of your vignettes! …transitional, never thought of it quite that way! I can focus on Christmas when there is calm first, great ideas!! 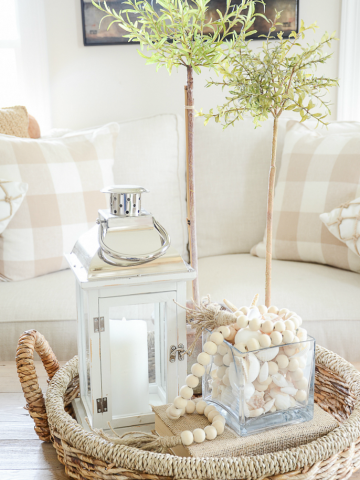 I love the idea of transitional décor–makes the house always feel fresh and exciting. Your home is ALWAYS beautiful, Yvonne. Was in Lititz and Strasburg recently, doing a little shopping, and thought of you. Enjoy following you on IG and reading your blog. 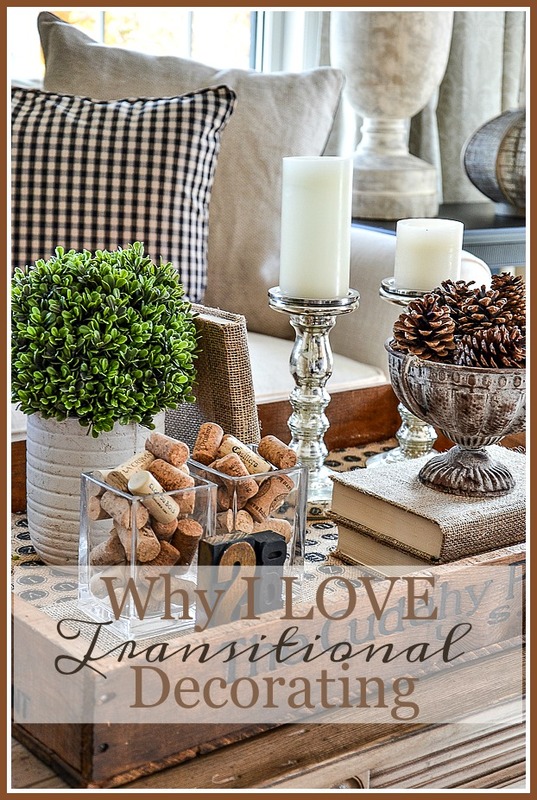 I so agree with transitional decorating right now. I am on the cusp of being tired of fall things and Halloween and have started moving in that direction also. The older I get..”less is definitely more” 🙂 !! Hello, I so enjoy your blog and all your ideas. The heat in Texas lasts until November , and it is hard to think about putting fall decor away just yet. However, your approach to a breath between the holidays certainly makes me think . I also love reading the comments. Usually I am sadden once the holidays ends, because the house is no longer filled with the beauty of this time of year, but thanks to designers like yourself, that’s no longer te case. Your gorgeous ideas are carried thought out the year. I love all the earth tone colors, as well as anything that used to decorate using nature. Thanks so much for all your eloquent designs and ideas. Can not wait to transition our home tomorrow and put Halloween away and get ready for Thanksgiving. Thanks yvonne for all your transional decoraing tips. Lovely and yes, calming. Would so love to get a consult with you! I love your transitional decorating style and ideas. I like to keep my outside fall decorations in place until Thanksgiving. Then there is a short transition before the Christmas decorations and light appear. With all the choices of bloggers to choose from, you’re the one I look to the most! I always have to see what my girl Yvonne is currently pinning, cooking, or decorating…I love your style! You are so so sweet, Tammie! Thank you for being a part of the StoneGable family! For me I find I can transition my off white artificial pumpkins to thanksgiving and then to Christmas with the addition of appropriately colored ribbons and bows either attached to the pumpkins or added into the vignettes. Yvonne, love, love your blog. It’s a joy to read each day. Your home is beautiful! You have such a sweet spirit! Thank you for sharing your life and your blog, and Our Lord Jesus Christ. Beautiful!! I also love transitional decorating. I have several pieces that work in any season and other items like pillows and or throws that are seasonally inspired to switch to different seasons or holidays. Thank you for sharing your fall decor with us! Love it! This post came just at the right time as I was wondering what to do with some of my decorations before diving into Christmas. Love all your ideas! Thanks for all your advice. I love your style! Love the burlap covered books but burlap makes me sneeze—maybe linen instead. My struggle is typically post-Christmas and what to do until Spring decor comes out. 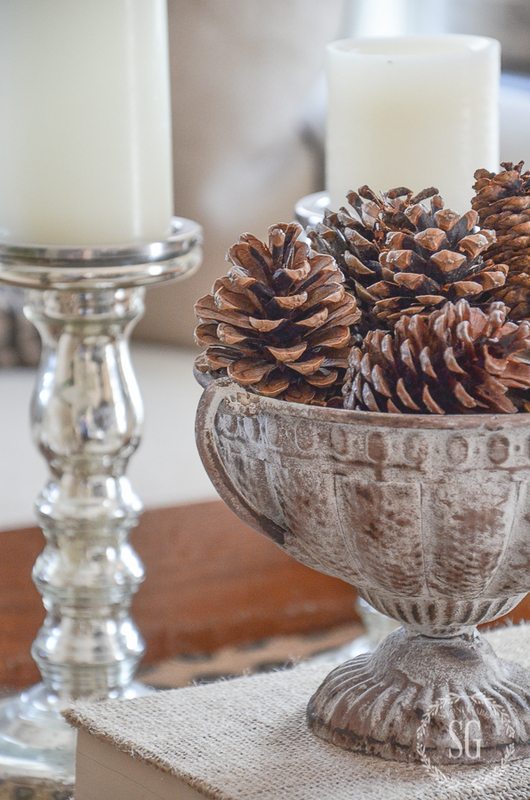 These ideas could work – maybe just using bleached pine cones instead? I hate the sudden feeling of blah when all the lights are down. I love your transitional decorating style. Your home and blog are always so inspirational. I could move right in!!! 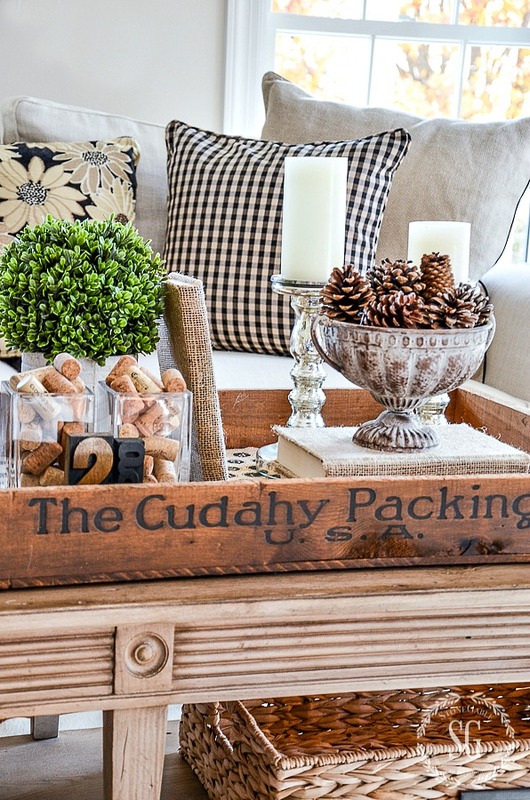 Love all the accents- corks, pine cones, candles = perfect Transition! I love your “less is more” approach to seasonal decorating. I have finally stopped redecorating my entire house for the holidays. So much easier and less to put away afterward. I will be clearing out some Fall and my vintage Halloween items this week, and transitioning into a lighter feel for Thanksgiving until it’s time for Christmas. These are great tips! I do have a few turkeys and some Bethany Lowe pilgrims that I love to have out, so I’ll be bringing those into my décor, but keeping it light! Love your ideas & so enjoy your blog!! Very inspirational & doable!! Since I have a small cottage, I try not to clutter it too much, the mantel is very fallish with leaves and bittersweet right now, but I will take down the small amount Of Halloween and leave the garland up until Thanksgiving is over, then we start with Christmas, then after Christmas I go what I call the Winter Solistice, simple and clean…rest, relax! I live in coastal SC, I miss some of the Winter quiet from New England, a break from gardening!!!!!!! Thx Yvonne but how do you show off Thanksgiving if you are in your transitional mode? I love that you use items we can easily lay our hands on or find in our stash. It’s not about buying the latest thing. Simple.Homey.Inviting.Comfortable. Yvonne, I really enjoy your posts! 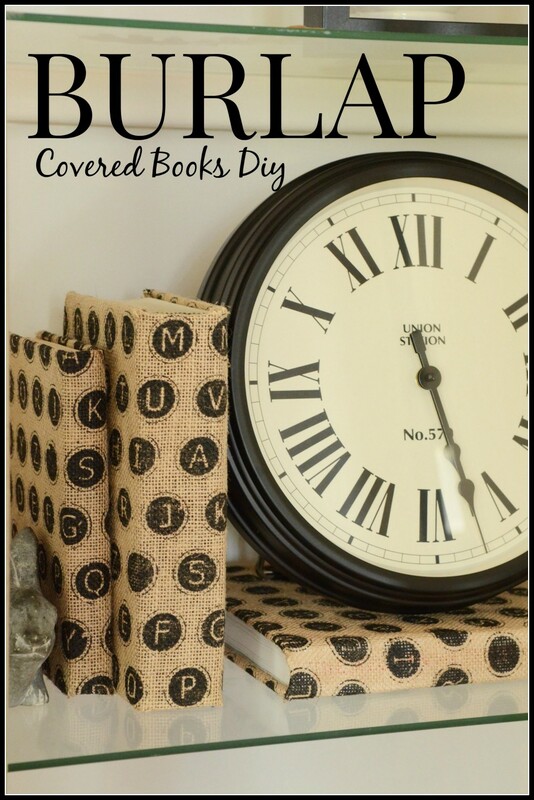 Love your idea of the “burlap” books! I’m going to do this to some of mine. Transitional Style Decorating makes so much sense. You show many great ideas. I am studying your photos. Thank you for all the inspiration. I with you Never met a pine one I didn’t LOVE. I am going to take your advise and put away all signs of fall decor BEFORE I drag out the Christmas boxes. Less stress is best! I’m a bit surprised that you put fall away before Thanksgiving so I can’t wait to see what’s next! I absolutely loved the Christmas decoration organization plan I saw yesterday! So smart! I LOVE the transitional colors!!!! They are so calm and relaxing! I would use these as you have for all of Fall and into early winter. Great job!!! 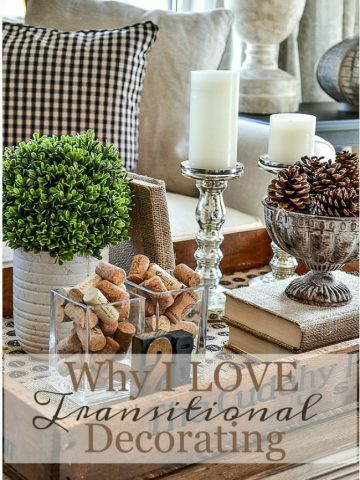 I never have heard of transitional decorating, but it makes total sense. The house and housekeeper both need a breather before elaborate Christmas decoration arrives. Love your style. Love your home. I would love to have you help me decorate! I always love viewing your decor and seeking ideas. Thank you. Sometimes my biggest decorating dilemma is organzing..Keep up the beautiful looks. Great tips Yvonne. I too like a bit of a break between seasons of decor. Like sports these days it seems they all run together. A bit of time in between is refreshing and makes me appreciate the changes all the more. Hello! I just recently discovered you and am excited to follow along with your decorating style which is exactly what I’ve been looking for! I bought the Buchanan tartan blanket because of your fall front porch and am eagerly waiting for it to arrive. I’m thinking of doing a black and cream master bedroom. Thanks for the example with your transition photo. I love it! So soothing and calm for our senses. Yours is the one email I look forward to each morning. Inspires me to get up and get moving. Though I see you keep with neutral fall colors as you enter November, I’m surprised that you remove pumpkins as they are associated with Thanksgiving-at least in my mind. Do you put out any decor that celebrates Thanksgiving? Hi Cindy, I set my table for Thanksgiving with lots of pumpkins and all the fall trimmings. But the rest of the house is pretty pared down with just hints of late fall. After today I will put Fall away and use that “breathing room”until xmas. Look forward to your emails every day! You truly make my day! I’m so glad I found you! 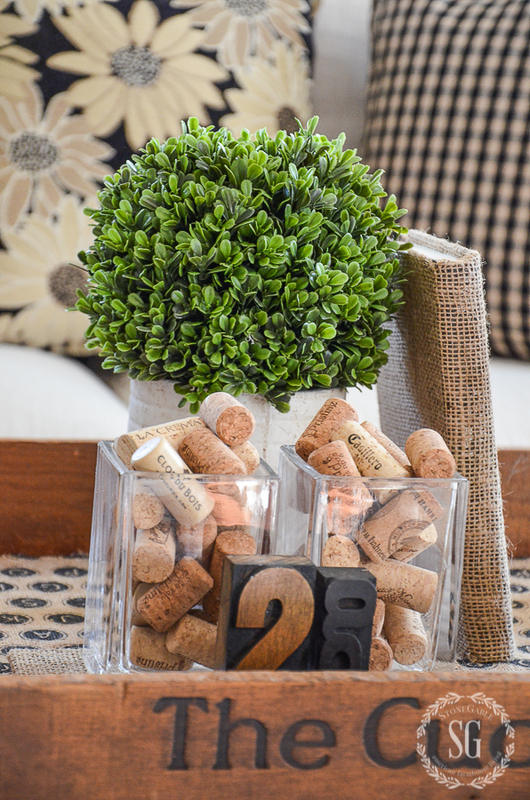 Love your ideas and your approach to decorating! I could not agree more! The quiet peacefulness of the darker colors as a break before the Light and Bright of Christmas is perfect! Great advice and beautiful photos. I love your blog! Looks like you could help me solve a lot of my decorating questions–love your style. Love your ideas, nice, clean, and crisp. Love this plan! I usually leave fall decorations up til after Thanksgiving, but things do get a bit crowded. Setting up a clean slate to anticipate the next season is a wonderful way to focus my efforts on what is to come, and count my blessings as the seasons change. I love your decorating style. Simple and elegant! This blog is my favorite! I keep dreaming and hoping I can come close to doing as well as the pictures I’m seeing. Quite a talent for decorating and I appreciate it so much! I love this one about transitioning–lots of great ideas! Thanks so much Maria! Hugs to you from StoneGalbe! HELP!!!!!! Where can I buy the black rod and hook in your kitchen that hangs the cups???????? Also, previously, recently you gave us a place to order the wooden crates. Please tell me again. Love the use of color, textures, values in your decorating. Would love to have the panache you have with decorating. I follow you daily and each day is a gift. Thanks. I also agree with the “no cross-decor” ! However, I get rid of all the Jacko lanternso, and anything Halloween related, but I like to keep my mums and pumpkins out until Thanksgiving! I feel it gets lost between the two big holidays. Your vignettes are always so composed yet fresh, I need some tips for doing it well. I seem to think that in my home, these small vignettes just look like clutter. If there is a rule for distance of placement – I need to figure that out. Thanks for your wonderful ideas! Beautiful as always. I enjoy seeing how you use things from season to season. It reiterates that we don’t need a lot of things, just a few special items to blend with the seasonal items. I will be putting away my halloween decor, it is truly spent, I will pare down and enjoy the few weeks now before Christmas with less. Your house is so inviting, and your ideas and suggestions help us all. I too like a bit of a relief between the seasons, so this was timely. as the days get shorter I like to add some colour to my home but in small doses. And this is the time of year i like to go to the shops to check what is new just to look not buy, unless ! it is something that talks to me. So Thanks once again. want to decorate for the upcoming seasons of Thanksgiving and Christmas yet. It spells relief to me too! 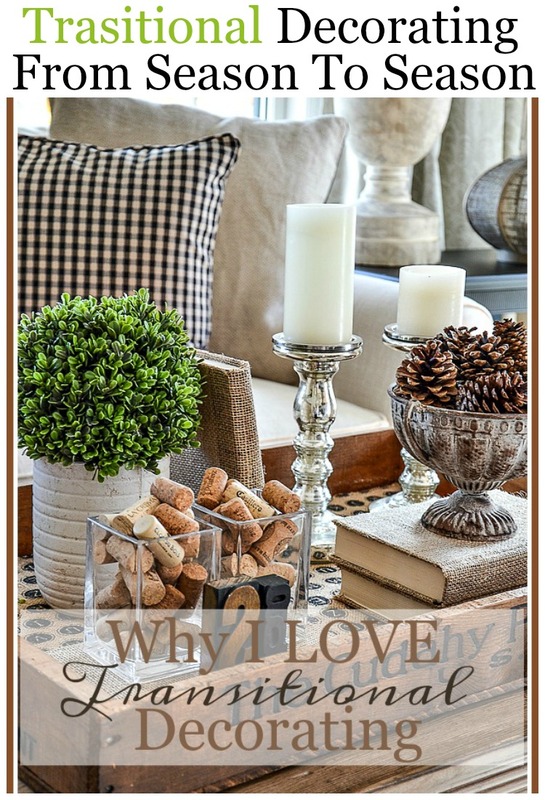 I will be decorating lightly this year with the move and this post is really inspiring me. Transitional decor will be my style for awhile. I am ready to do this transitional decorating tomorrow after Halloween. I need those pumpkins for the little ones that trick or treat at our home. Thank you for the ideas that I will incorporate tomorrow. I am ready. I like to add shells and driftwood in with my pine cones to add a variety of textures and shapes. Guess I just can’t let summer go. Carol that sounds beautiful, especially if you live near the beach! Thanks for your sensible, doable decorating advice. I really look forward to your email each morning! Thanks, Val! I’m so happy you are one of my readers who reads my newsletter! You always make decorating look effortless. Just the right touch of everything, every time. Great tip on getting ready for the next holiday.? Yvonne, do you let this transitional decoration be what you will use for Thanksgiving, or do you have something else planned? The older I get the better this type of decoration is getting, lol Hope things are well with your family. Transitional decor is my Thanksgiving decor. I do set a table with lots of fall inspired elements. But the rest of the house stays pretty transitional! Yvonne, so what transitional decor is on your mantle? 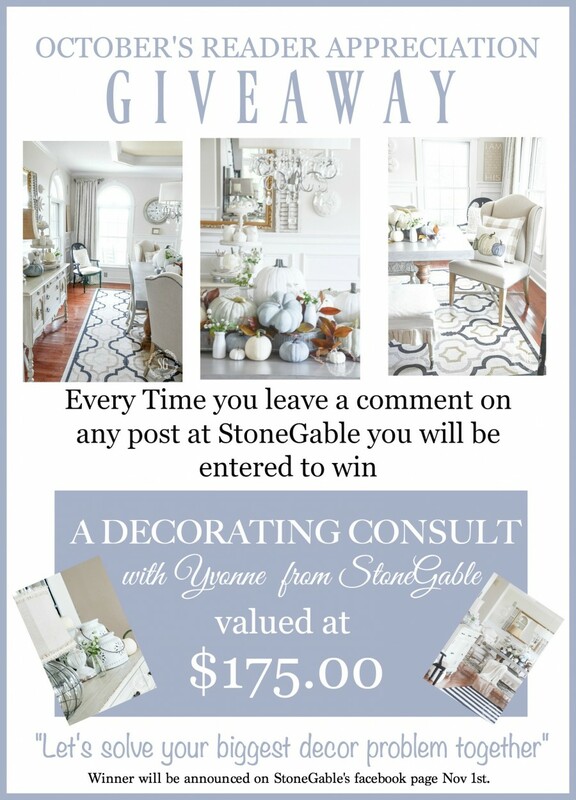 I love your style of decorating, Yvonne! The colours, textures and feeling are so compatible! Clare, decorating with neutrals is so easy! The key is lots of texture! I’m thinking this is my style of decorating, but I still have no idea! I need to start saving corks. Love this idea.